This crowning piece of Orissan architecture and sculpture, built in the 13th century A.D. The golden era of Orissan art is poetry in stone and a world heritage monument. The walls of these magnificent ruins have exquisite sculptures covering many aspects of life. Scenes of love and war, trade and court transactions, hunting, catching of elephants, teaching of sages, amorous dalliances, dancers and mythical figures-all vie for attention on the panels and niches of this immortal work of art. Surasundaris, heavenly damsels, freestanding, larger-than-life monoblock female statues playing the cymbals, drums, flutes, adorn the top of the temple. Beautifully carved couples engaged in myriad modes of amorous union, with their incomparable charm, are also attractions for the visitors. Every day the Sun God rises from the lap of the blue ocean close by and casts His first gentle rays on the sanctum sanctorum and then circles the temple during the course of the day, illuminating the three magnificent images of the morning Sun, the Mid-day Sun and the Setting Sun. The 24 giant wheels of this temple-chariot symbolizing the divisions of time with there intricate carvings on the spokes and the axle heads, the seven caparisoned horses representation seven colours of the Sun, the Navagraha or Nine planet panel are living pieces of the glory of Orissa’s past. 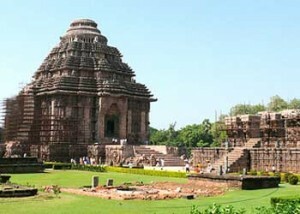 Konark is a many splendour gem of Orissan art. Its beauty is not for description words. It is to be seen, enjoyed and savored, not once but again and again for it is truly a thing of beauty, a joy forever. Today UNESCO as a world heritage site protects the temple. Konark Beach: Only 32 km from Puri on Marine Drive, one could find a sprawling beach at Konark-rated as one of the finest in the world. With a long stretch of clean sands-cool blue sea making rapid in rolling waves-the beach clams to be one of the best in the eastern coast for having a lovely serenity of its own. Chandrabhaga Beach: A short walk, ride or drive from Konark, takes one to the beach known as Chandrabhaga, unspoiled by time and men. Quieter than Puri beach, it offers beautiful sunrise and sunset. Ramachandi: Ramachandi is situated 8 km away from Konark. Temple of Goddess Ramachandi on the confluence of river Kushabhadra with the sea and also a nice picnic spot is located here. Kapaleswar: Kapaleswar is situated 10 km from Konark. Here is a Shiva shrine on desolate sand dunes. Kurum: Kurum is situated 8 km from Konark. It is excavated Buddhist site. Kakatapur: Kakatapur is situated 25 km away from Konark. Shrine of Goddess Mangala are situated on river Prachi. Chourasi: Chourasi is situated 35 km from Konark. Temple of Goddess Barahi, which is a typical order of temple architecture, is located here. This entry was posted in Konark Temple, Orissa. Bookmark the permalink.